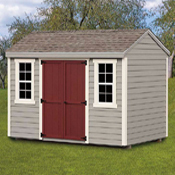 Quality Amish-made storage sheds for all your needs! 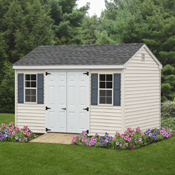 Whether you need to store lawn and garden equipment, patio furniture, sports gear, beach gear or bicycles, Bayhorse offers quality Amish made sheds for every need! Turn your shed into a workshop or garden-lover's dream by adding workbenches, shelving and more. 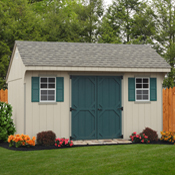 Or add decorative touches to make your shed the centerpiece of your backyard with flower boxes, transom windows, double arch doors and much more. 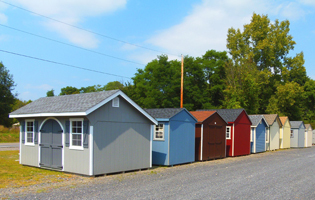 If you need something right away, take a look at our In-Stock Sheds to see what we have available on our lot. 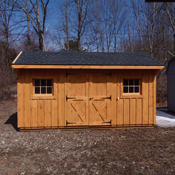 We also have a wide range of custom order sheds including Board & Batten, Duratemp, Vinyl and Clapboard models to match just about any home or setting you can think of. Our custom order sheds can be built with your choice of stain, paint, roofing options, extra windows, doors, storage lofts and more to create your perfect shed. 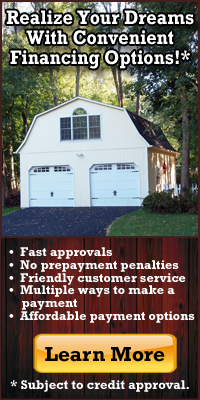 Own one of our sheds with a two-year BLI Rent-To-Own agreement. There is no security deposit and just the first month's rent to start. Choose an optional three-year agreement with a lower payment and a small security deposit. No credit check. Instant approval. Ask about 90 days same as cash! Find out more and apply online today!